BACKGROUND: Laparoscopic distal pancreatectomy (LADP) has been applied to many cases in pancreatic surgery, but it is not yet a standard method for pancreatic malignant tumors. The chief reasons for it: (1) difficulty in efficient lymph nodes dissection, and (2) difficulty in the estimation of surgical stump with linear stapler. We developed “antero-lateral approach” with hand-assisted maneuver as a standard method for pancreatic disease including malignancy. We present our new methods in our recent cases to show this procedure superior to conventional one as above two problems can be overcome, so that open laparotomy should be replaced by this method. METHODS: For the last 10 years, 78 patients were treated with distal pancreatectomy for pancreatic tumor in our hospital. HALS with transperitoneal “antero-lateral” approach was performed in 9 patients (group A). Other cases consisted of open laparotomy (group B). The patients’ features, the operative details and the postoperative outcome in the both groups were compared. OPERATIVE PROCEDURE: In preoperative estimation by CT scan and ultrasonography, location of the tumor should be identified. The sites of laparoscopic ports, including Gel-port, are marked by ultrasonography before operation. In the operation, skin incisions for 3 ports, one of which is just left side of umbilicus and the other two are along the subcostal lesion, and one Gel-port (upper midline abdomen) are made. First, the lower pole and the back side of spleen is dissected from the retroperitoneum and then splenic artery is clipped just below the marking which is made preoperatively. The lateral side then the upper pole of spleen is detached from the retroperitoneum, followed by enough isolation of pancreatic tail and body from the retroperitoneum (Portal vein should be visible). Finally, pancreas is cut with conventional method without GIA and the stump can be sutured through the small incision (Gel-port). Further lymph nodes dissection can be fully performed using operator’s left hand. RESULTS: In group A, the average hospital stay was 10 days, while 16 days in group B. Operation time, intraoperative blood loss did not show any difference. And in the aspects of intraoperative and postoperative complication, there were not any complications in the two groups. 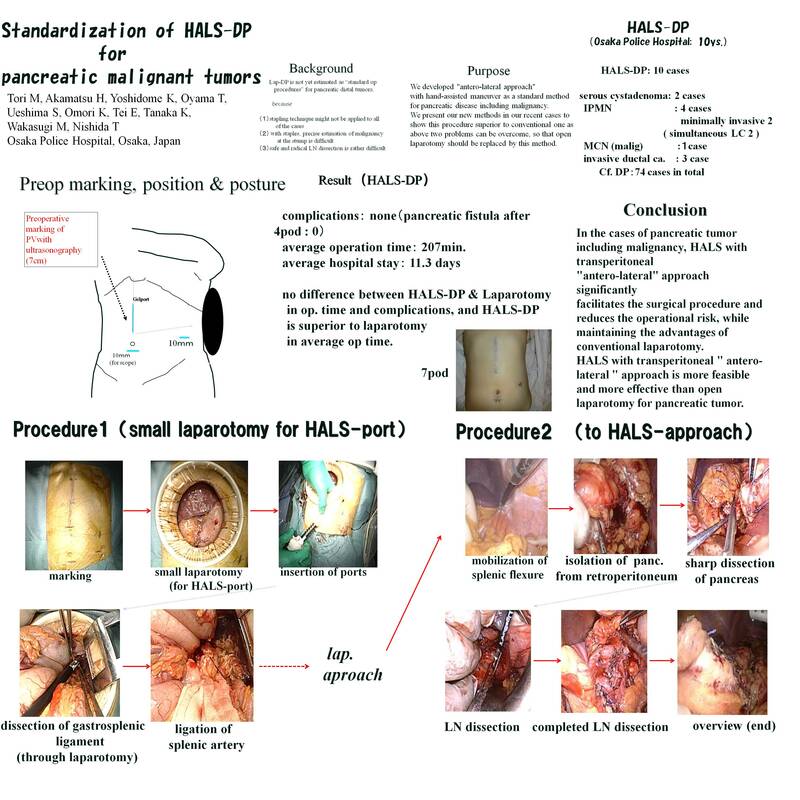 CONCLUSIONS: In the cases of pancreatic tumor including malignancy, HALS with transperitoneal “antero-lateral” approach significantly facilitates the surgical procedure and reduces the operational risk, while maintaining the advantages of conventional laparotomy. HALS with transperitoneal ” antero-lateral ” approach is more feasible and more effective than open laparotomy for pancreatic tumor.